In celebration of International Women’s Day, Nottingham Roller Derby are opening their doors and inviting you to find out more about the fastest growing sport in Europe! International Women’s Day is a great opportunity to celebrate and Nottingham Roller Derby is hosting a meet and greet event on Saturday 12th March at St George’s Center in Netherfield. This is a fantastic opportunity to come and meet some o f the members of Nottingham Roller Girls and the Super Smash Brollers, discuss the intricacies of the game, rules and equipment. 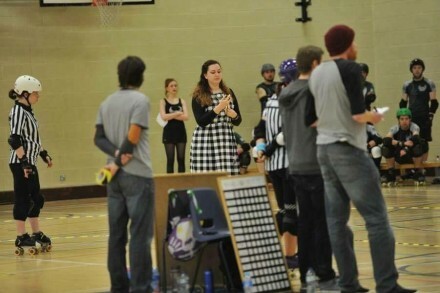 At Nottingham Roller Derby we feel that everyone has an equally important role to play and today, our very own The enGINeer, shares her experiences of being a dedicated NSO with Nottingham Roller Derby. “I went to see roller derby for the first time back in 2011 and I was instantly hooked. The reason why was because it was a sport full of women who looked like me; the kids who were never thin enough to be good enough at sports at school. And here these women were: utterly athletic and amazing at a sport they loved. Roller derby is a home for women of different shapes, sizes, ages, orientations and abilities. Some women have children and some don’t. All of them are united in playing a sport that they each bring something unique to. I wanted to be part of it. However there was a snag. I have a long term illness called fibromyalgia. It’s actually incredibly common for something which so few people have heard of. It’s important to say that this illness affects people differently but we all live with varying degrees of pain (mine is pretty much constant and controlled with varying degrees of success day to day with medication). I am not well enough to skate. I’m still a part of the sport. I’m an NSO (that’s non-skating official for those not in the know). We work with the referees to make sure games can happen and the skaters can skate. We’re normally dressed in grey and if we’re doing our jobs well you’re unlikely to notice us much. My fellow NSO’s are as varied as the skaters and each brings their love and dedication with them. If you see our sport, fall in love with it but think “I could never do that!” you can join me by being involved, helping the games to run and be surrounded by inspirational women. Roller derby makes me happy. I wanted to share this with you. What we all love so much about roller derby is how inclusive it is. And this couldn’t be more poignant then on a day that not only celebrates women; but also overall equality. Team Crazy Legs (http://www.teamcrazylegs.com/) really embody this; their mission statement says “To provide opportunities for members of the Roller Derby community of any gender or background affected by mental health difficulties or chronic illnesses, either directly or indirectly, to skate, work and interact with others who have had similar experiences.” Certainly a message the roller derby universe can get behind and encourage. This entry was posted in Events, Experiences, News by Nikki. Bookmark the permalink.